Wow! I am absolutely fascinated by this cave of crystal giants (yes, those are people in the orange suits above) that was featured in this month's National Geographic. It is located about 1000 feet below the Chihuahuan Desert in Mexico. 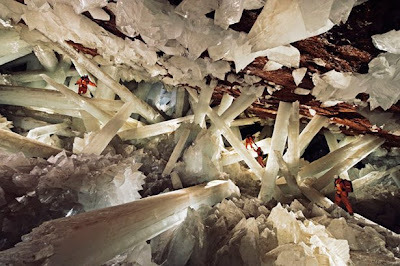 The crystals are composed of selenite, a form of gypsum (calcium sulfate). All of my classes are currently studying chemical bonding and this cave of crystal giants contained such awe-inspiring examples of ionic bonding that I couldn't help but excitedly show all my students what ionic crystals look like on a mammoth scale. To read more about this cave and the science of its formation, click here.